..:: Humanitarian Blood Donation Day “PTI – Making an imprint on the community” | PTI.COM.VN ::.. Blood donation is a noble act of Vietnamese people and has become a tradition among officers and employees of Post and Telecommunication Joint Stock Insurance Corporation (PTI). In 2018, on the occasion of PTI’s 20th anniversary and during the Youth Month - March 2018, the corporation’s Trade Union and Youth Union organize the Blood Donation Day within the whole system. 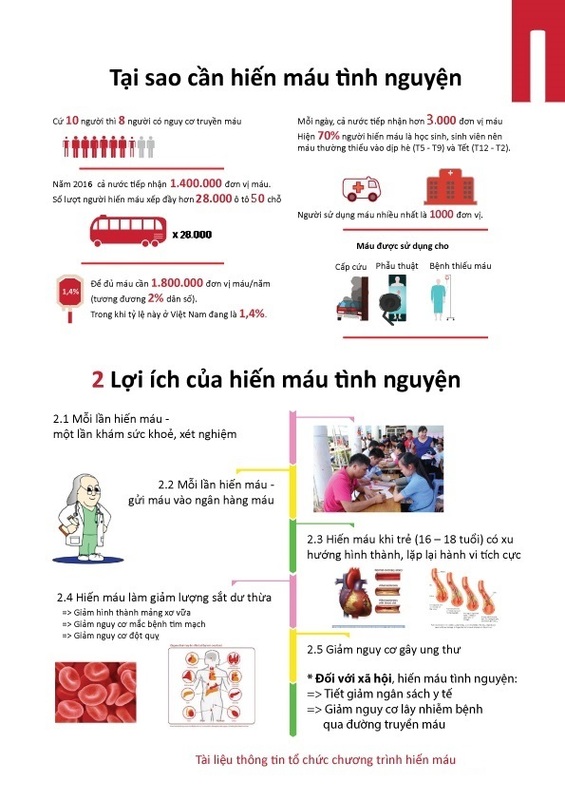 - There is a need for blood every two seconds in Vietnam and on average one in every seven people who visit hospitals needs a blood transfusion. However, the country currently meets only about 60% of the demand for blood. - “A blood donation can help save up to three people” (one pint of blood can yield up to three blood products and therefor can help save up to three lives). - Most blood donations are for cancer patients. * Blood donation is a noble and humanitarian act. “A drop of blood is given; a life is saved”. Please, if you're able, donate blood. - A blood donation means a medical examination. - Donating blood regularly can help to reduce how thick and sticky your blood is, thus allowing blood to flow more easily through the blood vessels and reach the heart faster. - Donating blood should limit the negative effects of excess iron, thereby diminishing the buildup of plaque in coronary arteries and reducing your risk of heart attack and stroke. - With blood donation certificates, blood donors will be given blood transfusions free of charge in the same amount of blood as they have donated. - Morning, Thursday, March 29, 2018: PTI Thang Long - Hoa Dang Building, 290 Nguyen Trai Street, Trung Van Ward, Nam Tu Liem District, Hanoi. - Contacting with local health facilities to organize blood donation days. - Time for blood donation: Before April 15, 2018. This is an annual activity of PTI’s Trade Union and Youth Union and a meaningful movement for the community. It also arouses affection and sympathy among PTI’s employees and members of the Trade Union and the Youth Union. Member units are strongly recommended to effectively carry out the movement to celebrate PTI’s 20th anniversary.